Time to catch up as we move into the fall season. 2014 has been a busy year for Spirit Golf and we have lots of good news to share. Earlier this year, we began an agreement with Warminster’s Five Pond Golf Club to provide a Professional Golf Management contract. In July, we successfully opened the new J.R. Smith Learning Center for the Monmouth Ocean First Tee Chapter. The construction began in September of 2013 and we were all very pleased to see the three hole course located in Ocean County Park open on time for the summer sessions. In August, we also signed an agreement with Mill Race Golf and Camping Resort. We are very pleased to be working with the Williams’ family to continue the wonderful traditions they have created the past 30+ years. We are also pleased to announce two new additions to our executive team in 2014. Frank Draper took the position of Director of Business Development in March of this year. Frank has been an advisor and involved in the golf industry for over 15 years. Most recently Ron Stepanek was hired to head up our Southern Regional Office out of Palm Beach County Florida. Ron will be Spirit Golf’s new Director of Player Development. Ron most recently was Director of Player Development for 10 years for the PGA of America. We are excited to have both gentlemens’ vast expertise in the game and business of golf as part of our team. Spirit Golf’s facilities also had some wonderful accolades in 2014. 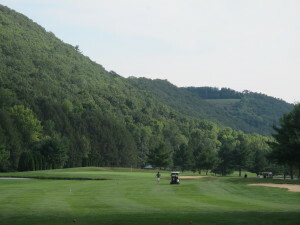 Both Five Ponds and Makefield Highlands Golf Clubs were named the Best of Bucks by Bucks County Courier Times Newspapers. Our team won four PGA Awards in 2014. Bob Doria , Public Merchandiser of the Year ( Bob’s second) and Ed Gibson, Player Development Award for the Philadelphia PGA Section. Mike Attara won both the Player Development ( Mike’s Sixth) and the Patriot Award for the New Jersey PGA Section. Makefield Highlands Golf Club won the Top 50 Best Driving Range (Public Golf Course) in the Country. Makefield Highlands Golf Club is also being honored as the 2014-2015 Club of the Year by the Pennsylvania Golf Course Owners’ Association. It has been a terrific year and we are most excited by the number of rounds played at our facilities and the great conditions our golfers have come to expect. Our programming and instructional activities continue to grow at each of our facilities and we look forward to keeping the activities and fun going through the fall season. Stephen Edelson for Asbury Park Press | The patch of land near the entrance to Ocean County Park sits less than two miles from the Lakewood Community Center, where J.R. Smith first picked up a basketball as a 5-year-old. Twenty-three years later, the Knicks guard made one smooth pass at the golf ball after another, launching short iron shots to one of three greens that will make up the First Tee of Monmouth & Ocean Counties facility, with the J.R. Smith Foundation signing on as the naming sponsor for the project. On Monday, September 09, 2013, Eagle Ridge Golf Club kicked off its Third Annual NJ Senior Masters Event. The event raised $18,000 for the NJ Golf Foundation and First Tee of Monmouth & Ocean County. 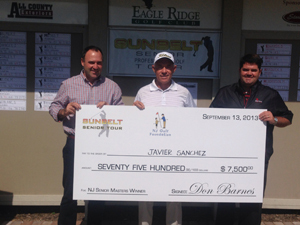 Mike Attara, winner Javier Sanchez, and Eagle Ridge Golf Head Pro Kevin Beirne at the check presentation. Sponsor and member teams competed along with pros in an 18-hole event on the September 10th. The Championship Round was held on September, 11th, 12th and 13th. Congratulations to Javier Sanchez who won the event at 9 under par and to Danny Edwards who won the Super Senior Masters at 1 under par. Local and national companies, as well as individual golfers, have embraced and supported this event and the tournament charity, New Jersey Golf Foundation. Over $43,000 was raised in the past three years through this event to support golf in schools, including Lakewood, Jackson, Howell, Brick, Neptune, and Plumsted School Districts. $10,000 of this year’s proceeds will be staying right within the Lakewood community to help fund the “First Tee Three Hole Learning Center” in Lakewood Park. “We really appreciate the work and effort PGA Professional and Spirit Golf President Mike Attara, has done to pull the local business community in to support both the charity and bringing the Senior Professionals to Lakewood, NJ,” says Tom Eubank, President of the Charity Pro Am Tour. NJGF, Spirit Golf Management and Eagle Ridge Golf Club have been helping raise funds through the Senior Masters event to support the NJGF golf in schools program and the Monmouth & Ocean First Tee Chapter. In addition to helping raise $10,000 for the new teaching facility, Mike Attara of Spirit Golf Management has been acting project manager for the new First Tee Three Hole Learning Center in Ocean County Park working with course designer Brain Ault and course contractor Tony Pavelec. The new facility is scheduled to open late spring/early summer of 2014 and will provide the children of Lakewood with a chance to learn the game and life lessons provided as part of the First Tee and NJGF program. Golf 2.0 is off and running and if we all do our part as an industry, this strategy can really make an impact on 61 million lapsed golfers. It can also help us drive new players to the game and retain the existing core golfers. 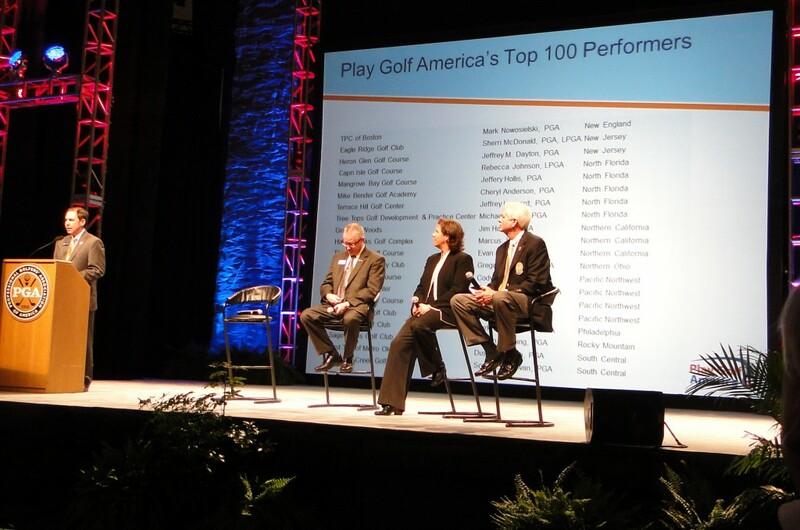 The PGA Merchandise Show was the official kick off for the industries’ Strategic Player Development Program. Jack Nicklaus provided opening remarks on the first day, showing his support and excitement for this new program. It was great to be a part of the introduction of Golf 2.0. I am on the national committee for this program and spoke at the show on how to retain our beginner players. I was honored to share my insights on a subject that is critical in today’s golf industry. During that hour presentation, I presented many different ideas on how to engage and retain new players. I talked about how to break down the barriers that keep people from engaging in the game of golf; barriers like time, money, lifestyle and difficulty of the game. You have to create the right program to make these players comfortable and then market it to them using the right venue. Sherri McDonald, PGA Teaching Pro at Eagle Ridge Golf Course, talks on behalf of Spirit Golf Management. Note Eagle Ridge Golf Club on the graphic visual. Sherri McDonald, Director of Instruction at Eagle Ridge Golf Club, presented on the PGA Forum Stage as part of the Play Golf America Conference. Sherri shared best practices and case studies from Eagle Ridge Golf Club. Sherri is second from the right in the photo below. It was good to see so many people in the golf industry paying attention to what we, at Spirit Golf Management, have always been focused on, engaging the public. Creating the right player development programs and finding ways to engage customers in your specific local community are key in growing the game of golf and right now these concepts have everyone’s attention. Spirit Golf Management. Growing the game one course at a time.